The new wave of kids’ music has produced a number of fairly established artists by now, and parents can rely on a new album by almost any of them to be superb. My family has gone through several of waves of discovery, starting with They Might Be Giants and Dan Zanes, through a middle period of folks like Recess Monkey and Elizabeth Mitchell, and on to more recent discoveries like Secret Agent 23 Skidoo and Frances England. But at this point, a good percentage of the children’s albums I see are from musicians whose names I already know. But as I’ve mentioned before, I haven’t lost that thrill I get from listening to a solid album by someone whose name I’ve never heard before, which by now generally means debut albums. 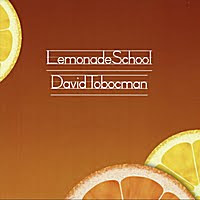 Still, somehow I missed David Tobocman’s first CD, I Count to Ten and Other Very Helpful Songs, in 2008, and his name was still new to me when Lemonade School, his new collection of mostly folk-tinged acoustic guitar and piano songs, came out. You hear right away that Tobocman’s influences include the likes of James Taylor, Randy Newman, Jackson Browne, Marvin Gaye, and the Beatles (the opening track, a cover of their “Hello Goodbye,” instantly grabbed the full attention of my two-year-old in mid-tantrum, soothing him magically). And his songs are pleasantly reminiscent of these artists without veering into the derivative. As you listen more closely, you realize that Tobocman’s lyrics are full of interesting twists and surprising, quietly clever internal rhymes; this guy has a craftsman’s knowledge of songwriting. (Indeed, he’s a professional film and television composer.) All in all, Lemonade School is one of those CDs with instant kid appeal that at first seems merely pleasant to parents, then grows more and more appealing every time you hear it. If, like me, you weren’t familiar with its creator’s kid-music oeuvre beforehand, it’s an impressive introduction. New Music: Wake Up, Clarinet!